A loan of $4,575 helped a member to buy more green vegetables to sell to her community. Eduleda is 33 years old, married, and has two children . She owns and operates a green vegetables business, which she has been doing for five years. Her business is well-organized. She works from 8:00 a.m. to 8:00 p.m every day. Eduleda is requesting a loan from VisionFund Rwanda Company, which she will use to buy more green vegetables to sell. She plans to reinvest her profits in her business and save for the future. Eduleda is the leader of the group called Unity in the local language. She is pictured above with her hand raised up. It supports entrepreneurs helping to rebuild Rwanda's economy. 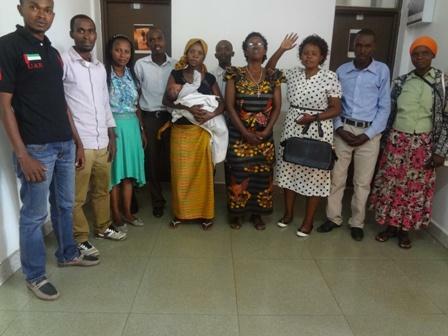 This loan helps low-income entrepreneurs in Rwanda grow their businesses and, ultimately, to support their families. These loans typically serve very poor and rural clients and particularly women, who often lack access to the traditional collateral needed for a loan. VisionFund Rwanda serves these entrepreneurs through both individual and group loans and provides them with financial education and tools for them to save money for the future. By supporting this loan, you are helping Rwandan entrepreneurs build the means to support their families and improve their lives.